This fall's much-anticipated BioShock Infinite will now be released on February 26, 2013, publisher Take Two announced this morning. The game had been planned for an October release. Updated with lengthy note from Ken Levine. "When we announced the release date of BioShock Infinite in March, we felt pretty good about the timing. Since then, we've uncovered opportunities to make Infinite into something even more extraordinary," the game's creative director Ken Levine said in a press release announcing the delay this morning. "Therefore, to give our talented team the time they need to deliver the best Infinite possible, we've decided to move the game's release to February." BioShock Infinite was arguably the most-anticipated game of the fall. It's Irrational Games' follow-up to their beloved 2007 first-person-shooter/adventure BioShock. That game sent players to the undersea failed utopia Rapture and let players use a range of tactics to explore and fight through the mysterious city. Well-written and dynamic in its play, the BioShock was hailed as one of the best games of all time. A 2010 sequel, BioShock 2 returned players to Rapture. It was not made by Irrational, which instead worked in secrecy until August 2010 on a project revealed to be Infinite. 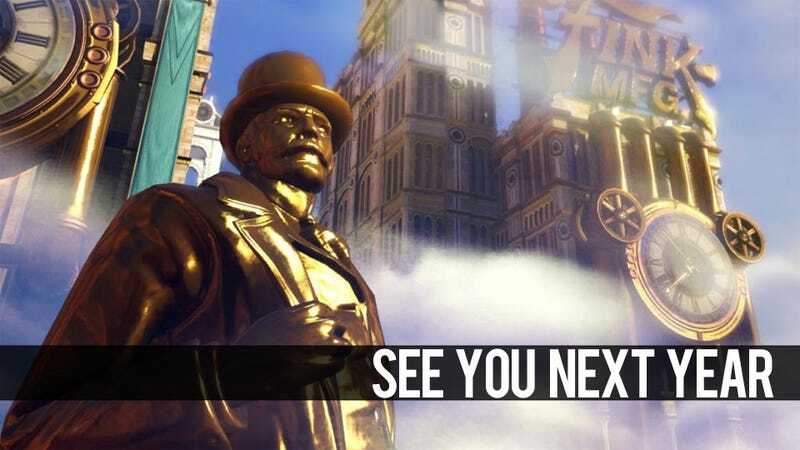 The new game puts players in the shoes of Booker DeWitt, a man sent to the flying city of Columbia in the year 1912 to rescue a woman named Elizabeth. From there, things go crazy in a city wracked by its own strange political tensions and imbued with a sense of American exceptionalism. Its links to the first BioShock seem to primarily involve the depth of its story-telling, its first-person perspective, the care put into creating a unique world for players to explore and its dynamic mix of player-triggered powers and player-shot guns. Irrational and Take Two have been promoting the game with a drip-feed of new info for months, an indication that the game should have been well on its way. Not well enough for an October release, it seems. We'll play it in February. For those struggling to confront a fall without BioShock Infinite this fall, you can look to Halo 4, Medal of Honor: Warfighter, Borderlands 2, Call of Duty: Black Ops 2 and many other shooters to potentially satisfy a first-person shooting fix. For those looking for a game as entrenched in Americana as Infinite, consider Assassin's Creed III, set at the dawn of Revolution. Since then, we've come to realize that some specific tweaks and improvements will make Infinite into something even more extraordinary. Therefore, to give our talented team the time they need, we've decided to move the game's release to February 26, 2013. We wanted to let our loyal (and very patient!) fans know this as soon as possible. I won't kid you: BioShock Infinite is a very big game, and we're doing things that no one has ever done in a first-person shooter. We had a similar experience with the original BioShock, which was delayed several months as our original ship date drew near. Why? Because the Big Daddies weren't the Big Daddies you've since come to know and love. Because Andrew Ryan's golf club didn't have exactly the right swing. Because Rapture needed one more coat of grimy Art Deco. What does this mean for you? It means a bit more waiting, but more importantly, it means an even better BioShock Infinite. The great can be made greater, and we owe it to both ourselves and to you, our fans, to take this opportunity. Irrational Games is one of those rare developers lucky enough to ask the people who sign the checks: "Hey, can we have a few more of those checks?" We are also going to hold off on showing BioShock Infinite at the big events of the summer, like E3 and Gamescom. That way, the next time you see our game, it will be essentially the product we intend to put in the box. Preparing for these events takes time away from development, time we're going to use instead to get the best version of Infinite into your hands in February.